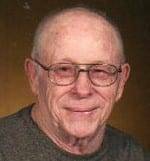 Jack L. Beckwith, 87, of Montpelier passed away Saturday afternoon at Defiance Area Inpatient Hospice Center. He was born on March 26, 1931 in Coesse, Indiana to Frank and Hazel (Knapp) Beckwith. On September 3, 1982 he married Rose M. Sellinger and she survives. Jack was a member of St. Paul’s United Methodist Church in Montpelier. He started working for the Wabash Railroad on the Extra Board, and then went to work for the Ohio Turnpike Commission as a surveyor, helping to build the turnpike at exit 2. Jack worked as a foreman for 37 years at Mohawk Tool until its closing. He then worked at Powers and Sons for a brief time before retiring. During his retirement he worked at Pamida in Montpelier. Jack was on the Reserves for the Montpelier Police Department for a number of years and was a huge Detroit Tigers fan. He is survived by his wife of 36 years Rose; five children, Vicky Landel of Somerset, Kentucky, Chuck (Joyce Franklin) Beckwith of Russell Springs, Kentucky, Joe (Deb) Bohner of Montpelier, Leslie (Carolyn) Bohner of Montpelier and Chris Bohner of Edgerton; ten grandchildren, thirteen great grandchildren and four great great grandchildren. Jack was preceded in death by his parents, five brothers, five sisters, granddaughter Holly Jo Bohner and first wife Shirley (Govin) Beckwith. Visitation for Jack with be on Tuesday, December 4th from 10am-1pm at the Thompson Funeral Home on Main Street in Montpelier. Services will follow at 1pm at the funeral home with Pastor Richard Blank and Pastor Beniah Harris to officiate. Interment will be at Riverside Cemetery in Montpelier. In lieu of flowers the family requests that memorial contributions be made to Williams County CHP-Hospice. Be the first to comment on "Jack Beckwith (1931-2018)"